Baseball is a game that is tightly woven into the culture of both the US and Cuba. It is clearly the top sport in Cuba and if you play it, where and when you play is controlled by the Castro regime. That said, there are 18 Cubans now playing in the major leagues, including Yoenis Cespedas. who just played in the World Series for the Mets, and they all had to endure a risky defection to get there. ( in fact, because of that defection one of Mr. Cespedas relatives in Cuba has been jailed). Cuba does send some of its players to other countries but the Govt. decides when and where and takes a piece of the action. Major League Baseball is exploring the possibility of playing exhibition games in Cuba this spring but more importantly, has been working on a system where they can recruit players from Cuba (and its believed there are many more who's talent is good enough for Major League Baseball), but the Castro regime wont allow it unless the government gets compensated and that would violate the US Embargo.— Who knows when and if that standoff will ever be resolved. But if you love baseball, one of the Cuba trips that Insight Cuba offers is Baseball in Cuba. Not only are US companies banned from doing business in Cuba but any foreign company doing business with Cuba is not allowed to do business in the US. That explains all the old cars— because if Volkswagen or Honda want to sell in the US they can't sell to Cuba. Is also why the cruise ships don't stop here-yet. Almost every Caribbean cruise carries many U.S passengers— If a cruise ship docked in Cuban ports the embargo prohibits them from docking in the US for 6 months. That is going to soon change. Cuba, until Raul took over, was 100% socialist. Now only 85% of the people work for the state. The demand for tourism is so great they are allowing people to put their homes on Air B&B. They are also allowing people to start restaurants. As you would surmise, no one can really afford to start a traditional restaurant so they start with a couple tables in the living rooms of their homes and make the meals in their home kitchens. If it goes well they may take over another room in the home or Apartment and in some cases they were successful enough that they moved to a new home or Apartment and let the entire home become a small restaurant. We ate in one, The Magic Flute, on the 19th floor of an Apartment bldg, just across from the US Embassy with a capacity of about 40 or 50. It was outstanding. 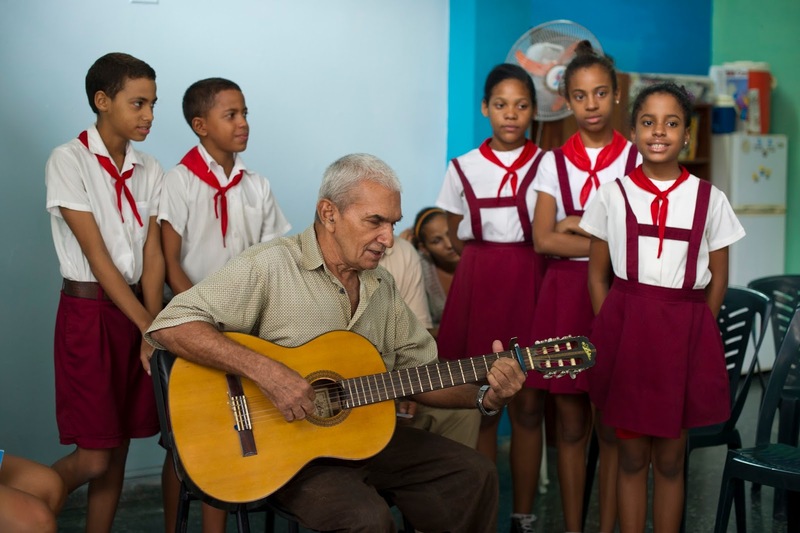 The music in Cuba is worth the trip all by itself. We heard several jazz bands that are world class. 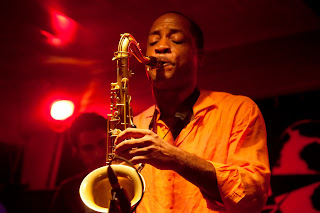 Progressive jazz, Afro Cuban jazz and much more. A very few of the lucky ones are allowed to leave Cuba to do tour dates, but the hoops a Cuban citizen has to go through to get a visa to leave are overwhelming. At the jazz club, La Zorra El Cuervo, we heard the contemporary jazz group Jazz En Trance. These guys were world class. Then we went to Pastorita performing arts high school in Matanzas, and heard several students play short recitals for us. Everything is paid for by the Government, including room and board and the instrument they are studying. There are only 4 recording studios in Havana and they are all very busy. We visited Abdala, where Beuna Vista Social Club recorded, is the largest and most prestigious. I asked a couple of the musicians what the biggest challenge of being a musician was in Cuba. We heard about the problems with the economy and communism and travel restrictions but the guitar player told us there is no place in Cuba where they can buy guitar strings. I am sure it has to do with years of trade embargo with the US If you go to Cuba pack a few sets of guitar strings in your bag, It will be easy to find someone who will greatly appreciate the gift. Old beautiful vintage cars cruise up and down the broad avenues and seaside roads every day. When people talk about Cuba the vintage cars are usually near the top of the conversation list. I am sure that they are what remained from the start of the US embargo period. 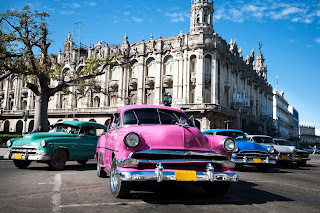 These are cars that are 50 to 60 years old now, hundreds of them cruise the streets of Havana, and mostly in tip-top condition. The pride of ownership shines through. I asked a couple car owners “what is the biggest challenge with having these cars in Cuba?” The answer was overwhelmingly parts. Due to the embargo, I am sure, the auto manufactures were not allowed to send auto parts to Cuba. But the Cubans are nothing, if not clever and inventive, good at finding innovative solutions for their challenges… so they learned how to rebuild parts, found other sources than the US and had friends coming from the US bring them in their checked luggage. Maybe even tires— who knows. They have made a mini-industry out of these cars being an attraction. Some even have new LED headlights and some even have brand new engines (like a Toyota engine in a ’59 Ford Farlane). We were told of one car that replaced their engine with a washing machine motor. They serve as taxi’s but on an even larger scale they offer 1 or 2 hour tour rides of Havana. When they all convene at one location,it’s a bit like being at a back to the 50’s car show. Vintage Cars, Cigars, and Colorful architecture is what comes to the minds of most people when they think about Cuba. But there is so much more. I have been interested in visiting Cuba for several years now— and as US Cuba relations improve, I can just imagine the growth and development that will occur once things are totally normalized. So I wanted to see Cuba before all that changed. It seems to me, the development will be so great that most of Havana may end up like Cancun or Miami Beach. I guess we will have to see. The majority of the world visits Cuba without restriction. Not so for US citizens, who are highly restricted and the tours must have specific purposes. Before 2011 even these kinds of tours were not permitted. It's a shame, because you don't have to be here but a few hours to see what a wonderful country Cuba is to visit. My first stop was the small town of Jaimanitas, and the studio of ceramic artist Jose Fuster. Just over 30 years ago he began decorating ceramic tiles, mostly in his home. He has now expanded to decorating most of the neighborhood and most of the neighbors homes. His work is fabulous and he is a brilliant folk artist, who chooses ceramic tile as his medium. I bought one of his tiles for $30 and I am proud to add it to my meager art collection. At 5:30 I checked into the Melia Cohiba hotel, on the waterfront in the center of Havana. For a country that is poor, and is considered to be 3rd world , this hotel is quite luxurious. Then I was off to dinner at El Templete which is famous for its traditional Cuban style seafood. Cuban food in general is quite bland, but this meal was scrumptious. After breakfast we had an hour lecture with Cuban musicologist Alberto Faya. In the context of survival he talked about what we do to preserve our lives and our culture. Conquerers, he told us, not only bring their concepts and culture , they impose it on those whom they conquer. So the Spanish, when they landed here in the late 1400s pretty much wiped out the culture of the native Cuban inhabitants. Thus came Spanish musical influence to Cuba. Shortly after that came the slave trade and the Africans infused the culture and music of their native lands into Cuba. That was his first example of what he calls Transculturation. His second example was Jelly Roll Morton . Because of the proximity to the US the influences of Cuban and American music became intertwined, with some American music (mostly Jazz) absorbing Cuban influence and vice versa. His talk was fascinating. Then it was onto our bus with my 24 newest friends for a walking tour of Old Havana. This used to be a walled city, but as it grew beyond its walls, the walls finally came down. Some remnants remain. 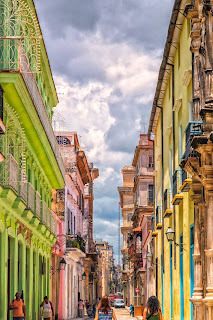 Old Havana is now pedestrian only. As I walked on the Plaza de Armas we learned about the Capitan Generals wife who got splitting headaches from the loudness of the cobblestone streets. So he had the street in front of his house dug up and replaced with a much quieter wood surface, which still exists today. Plaza de Vieja is a beautiful old plaza with very colorful and beautiful buildings, but we can already see stores like United Colors of Bennetton and Lacoste, staking out locations in preparation for the normalization of relations with the US Carnival Cruises is planning to add Cuba as a stop sometime in the next 6 months— then things are gonna change quickly. My lunch at Los Mercaderes was delicious, Cuban jazz accompanied our BBQ chicken and beans — Most restaurants here are state owned and operated but this one is private and I can see there is a big difference. Then our tour group split up. Maggie and I were the only ones who went on the Abdala recording studio tour and it was fascinating. There are only 4 recording studios in Havana. Abdala, where Beuna Vista Social Club recorded, is the largest and most prestigious. I asked a couple of the musicians what the biggest challenge of being a musician was in Cuba. We heard about the problems with the economy and communism and travel restrictions but the guitar player told us there is no place in Cuba where they can buy guitar strings. If you go to Cuba stick a few sets of guitar strings in your suitcase. It won't be hard to find someone who needs them. On the bus at 8:30 this morning and we headed for the town of Matanzas, a couple hours east of Havana. The first stop was at a publishing house where they preserve the culture of publishing hand made books. By handmade, I mean from scratch. They make the paper, stitch the binding, create the artwork, some of which may just be a collage, and make a limited edition of only 200 copies of each book. I think its safe to say J.K. Rowling won’t be looking for a publishing deal here. Some are in Spanish and some in English. I bought a book that is 1” by 1” and is an abbreviated history of Cuba. I am thinking about renaming it “Everything I ever knew about Fidel Castro”. This brings me to the educational system here in Cuba. It seems to operate at quite a high standard, in fact they have a literacy rate of 99.8% making it the second highest in the world. And its all free including University or a trade school, whichever you choose. And yes that could even include medical school, of which there are 23. The average salary here in Cuba seems to be 25-35 CUC a month. (1CUC=$1.00 US) A doctor makes an average of 70-80 CUC per month. That would be a very wealthy person in Cuba. The overwhelming majority of people work for the Govt. but they are given full education, complete health care and food rations. Not much to pay for but housing. A very few work in the private sector mostly at restaurants and Hotels that serve tourists. These lucky people seem to be able to earn more than government workers. All due to the recent changes that Raul Castro has allowed in Cuba since taking power from his older brother Fidel. I had lunch at Amelia Del Mar where we also enjoyed a performance by the dance and Congo drum group Afrocuba de Mantanzas. They were wonderful. If I didn't understand the African influence on Cuban music from Dr. Faya's earlier lecture, I certainly could see it in this performance. Today started with a visit to the local food coop. If I thought I understood the difference in lifestyle between Americans and Cubans, I had another think coming. My eyes were really opened up here. Food rations are issued to every citizen in Cuba at a cost of about fifty cents a month. For this they get staples like rice, pasta, sugar, milk some meat and a few more basics. Next door to the Rations store is the local market, which to me looked like a farmers market. Our group divided into 6 teams. We were each given approx. 1CUC and told to go in the market and buy enough food for one meal for a family of four. We all were able to accomplish it (amazing eh)? We brought it back to the bus and our bus driver Leo, chose which team presented the best meal. Leo got to take all the groceries home that we purchased. I think that gave him enough food for almost a weeks worth of dinners for his family.— So I now see their low earnings in another light. 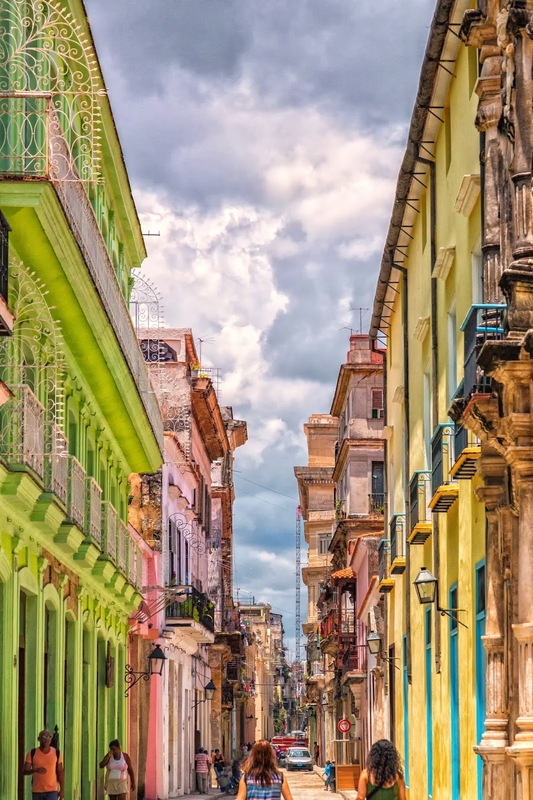 But it did create a wonderful discussion “Our standard of living is clearly much higher than the average Cuban, but are we happier because of it?” I don't know but I can safely tell you it's not as easy of an answer as you might think. There was one final stop on the way to the airport and this may fall under the category of saving the best for last. I visited a neighborhood dance studio, that they just call the Jazz Club, in the Santa Amalia neighborhood with several senior citizen jazz dancers. What a blast!! There were a couple young dancers but they were mostly in the late 70’s and 80’s and they not only danced the Rumba and Tango for us ,but after affecting us with their abundant enthusiasm they pulled me and everyone else in our group onto the floor to dance with them. We learned that for several years these dance gatherings were banned by Castro, but they kept going anyway. That ban has now been lifted. The joy on their faces as they all waved to us as our bus pulled away was truly inspiring. Cuba is a beautiful country, no doubt about it, but visiting here is more like a college course in culture and lifestyle. Come visit, meet the people and you will see what I mean.